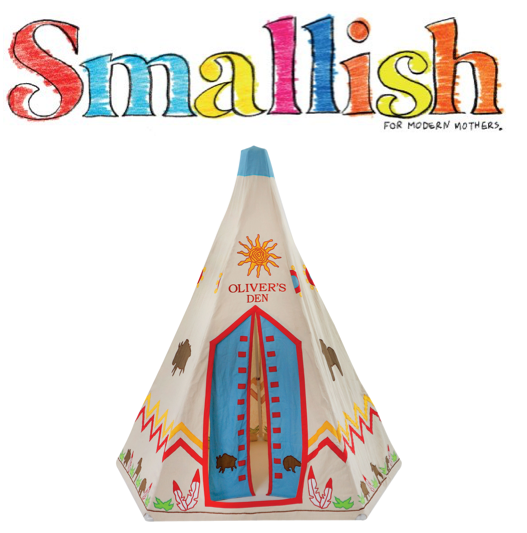 We have teamed up with Smallish Magazine to offer one lucky entrant the chance to WIN a personalised Kiddiewinkles Wild West Wigwam. Here’s what they’ve got to say! There’s nothing quite like watching a six-year-old serve breakfast to an imaginary dinosaur to make you remember the magic of childhood. Enchanted fairy doors, teddy bears’ picnics and cardboard boxes turned rockets to Mars, the importance of imaginary play for children’s social, emotional and intellectual development is well documented. So it’s little surprise that toys that help facilitate make-believe are top of most parents’ playroom wish lists. The wonder of imaginary play is the inspiration behind Kiddiewinkles creative play tents and wigwams, a range of beautifully made, indoor/outdoor dens that make perfect backdrops for wild adventures, torchlight fairytales and summer hide outs at the bottom of the garden. There are tent themes galore designed to appeal to budding astronauts, fairy princesses and seaside adventurers but our favourite is the colourful Wild West Wigwam, with its blazing golden sun, buffalo, bear and zigzag pattern. Like all Kiddiewinkles tents it’s made from heavyweight cotton with beautiful design touches (hand embroidery, intricate appliqués) that pass the keepsake test. We’ve got one Wigwam to give away to one lucky winner (embroidered with their name to make it extra special) and we’ll make sure it’s delivered in time for Christmas. Click here to find out more about the Kiddiewinkles Wild West Wigwam.